The plucky bravery of the ANZACs is one of our great national stories – it plays into our idea of who we are. But why is one of the touchstones of our identity based on a historic defeat? Some are sick of the mantras of ANZAC and mateship, while others believe worship of soldiers is inappropriate in an era when we’re still at war in Afghanistan. Are we becoming warmongers – or recognising the sacrifice of our defence personnel? Dr Simon Longstaff is Executive Director of St James Ethics Centre and chairs the Intelligence Squared debates in Sydney and Melbourne. Dr Brendan Nelson became director of the Australian War Memorial in December 2012. Prior to this, he was the Australian ambassador to Belgium, Luxembourg, the European Union and NATO (2009–12). Apart from overseeing a major transformation in Australia’s relationships with the European Union and NATO, Dr Nelson forged deep links with the communities of Flanders, where almost 13,000 Australians lost their lives during World War I.
Jeff Sparrow is the editor of the literary journal Overland. His recent books include Money Shot (Scribe) and (edited with Antony Loewenstein) Left Turn (MUP). Marilyn Lake is a leading Australian historian with a national and international profile. She have been researching the impact of war on Australian society for 30 years, the subject of both her MA and PhD thesis. John Martinkus has covered conflicts since 1995 in East Timor, Iraq, Afghanistan, Aceh, Sri Lanka and Burma for print and from 2004 to 2008 for SBS Dateline. He has published three non fiction accounts of the conflicts in East Timor, Aceh and Iraq and a Quarterly Essay on West Papua. Had enough of the rat race? Has your boss been tightening the screw? Well then, it’s time to let your hair down, put your feet up, and knock back a gin or two. Hightail it down to the Mandrake Bar for an evening of noir with some of the best ink-slinging dames the genre has to offer. Join Megan Abbott, Christa Faust, Denise Hamilton and Jeri Westerson as these skirts show the mugs how it’s done. Oh, and there’s booze, so keep the babes in their cribs, this event is 21 and over. 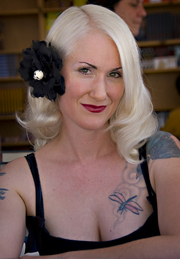 Christa Faust is currently considered a "single author." If one or more works are by a distinct, homonymous authors, go ahead and split the author. Christa Faust is composed of 2 names. You can examine and separate out names.